The book is oriented towards undergraduates science and engineering students; postgraduates and researchers pursuing the field of microbiology, biotechnology, chemical - biochemical engineering and pharmacy. Various applications of microorganisms have been covered broadly and have been appropriately reflected in depth in 12 different chapters. The book begins with an insight to the diverse niche of microorganisms which have been explored and exploited in development of various biotechnological products and green processes. 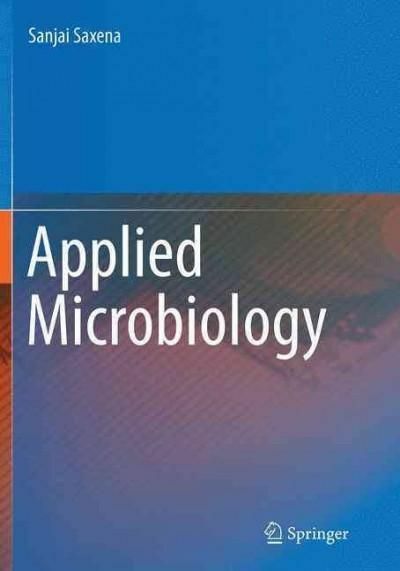 Further, how these microorganisms have been genetically modified to improve the desired traits for achieving optimal production of microbially derived products is discussed in the second chapter. Major route of production of microbially derived products and processes is through fermentation technology and therefore due emphasis on different aspects of fermentation technology has been given in the subsequent chapter. The development and deployment of biopesticides and biofertilizers which find tremendous application have been separately discussed under agricultural applications. Application of microbes for the removal of pollutants, recovery of metals and oils has also been discussed under environmental applications. The role of microbial systems in development of fermented foods and beverages have also been discussed in Chapter 6. The application of microbes in production of commodity chemicals and fine chemicals has also been discussed in separate chapters. A chapter has been dedicated to the tremendous applications of microbially produced enzymes in different industrial sectors. Another unique facet of this book is explaining the different methods by which desired traits of microorganisms have been improved for their efficacious and economical exploitation in the industry. A chapter is dedicated to exploitation of microorganisms in development of vaccines for human and veterinary use. Finally, the last chapter discusses the role of immobilization in optimization of industrial processes and development of microbial biosensors for industrial applications. Thus, this book is a holistic approach providing information on the present applications of microorganisms.